make communication easy and adventurous. Even the invention of mobile phones hasn’t dimmed the pleasure of using a walkie talkie, and kids love them for communicating with their family and friends. 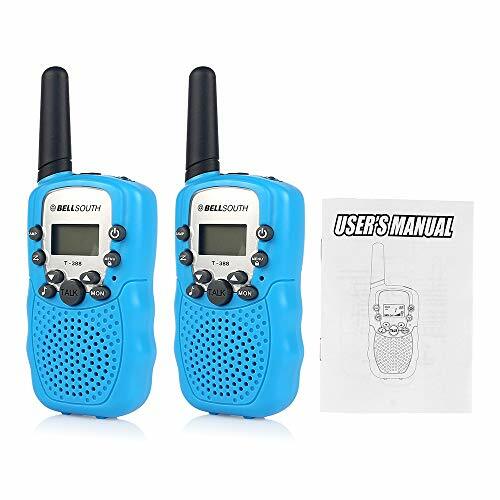 Whether going on a camping trip, or just staying in contact around the house, these top rated kids walkie talkies are the very best in terms of price and quality. You’re going to see that they’re all easy to use, incredibly affordable, and entertaining for your children, no matter what their ages may be. 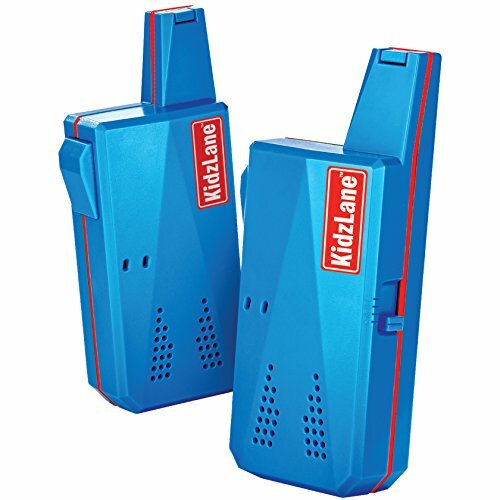 This kids walkie talkie from Kidzlane features a set of 2 units, with a 2 mile range, and they’re fun and easy to use for all ages. With a super long play time, and 3.5 hours of continuous use, you’re going to see that your kids love playing with these walkie talkies, because they feature simple push to talk operation, and they can use three different channels. With the clip-on belt holder, these walkie talkies are easy to take on the go, and all they require are three AAA batteries for operation. Children love these fun devices because they allow them to communicate with ease, and they help to add a sense of adventure to playtime. These units are lightweight enough to take on the go, and they’re easy to store when not in use. These are top rated walkie talkies because they’re made of durable materials, and they can seriously take a beating without showing any signs of wear and tear. When you’re ready to enhance your children’s playtime, then these walkie talkies are a valuable investment that the whole family is going to love. These walkie talkies are a top pick because they’re ultra durable and super easy to use. They also come with an LED flashlight that only adds to the fun and adventure. The set includes 2 walkie talkies, with rechargeable batteries and 2 charging docks so that you can recharge them in a snap. They also come with 2 hand straps, 2 belt clips, and a user manual, making these walkie talkies incredibly user friendly. Enjoy 8 hours of non-stop playtime, and they can easily be recharged in 3-5 hours. With the simple push to talk mechanism, your children are going to find that these walkie talkies are incredibly easy to use, and they can also adjust the channel and volume with the push of a button. There’s also an LED flashlight that makes these units ideal for camping and outdoors activities. There’s an ample 2 mile range, so your children can travel vast distances and still communicate with ease. All in all, the modern design and professional construction make these walkie talkies the ideal choice for a number of different fun excursions, and they’re durably constructed to stand the test of time. These walkie talkies from Bellsouth feature auto channel scan, which makes for fast open channel connection. They have a generous range that allows your children to communicate from vast distances, and they have a built-in mini LED torch with blue LED. The small size of these walkie talkies makes them convenient to carry around, even in small hands, and they’re intended for ages 4 and up. This is a great system for when you’re at the supermarket, shopping at the mall, or enjoying any outdoor activities. Superior to cellular phones, walkie talkies add a sense of adventure and fun to playtime. These units are made from solid materials that are tested for their performance and strength, and they’re lightweight enough to take on the go, so that your children can enjoy using them no matter where they are. There’s nothing more fun than using walkie talkies, and these models are built for the kind of performance that you can depend upon. Give your children the gift of fun and excitement with use of these delightful walkie talkies that are sure to stand the test of time. These top rated kids walkie talkies are the models that parents love, because they’re easy to use and quite affordable. You can be sure when you buy one of these models that you’re getting a product that is going to stand the test of time and give your children hours of fun communication, whether indoors or outdoors. These devices are also great for use when you go to the mall or out shopping, because they allow you to stay in contact with your child should they get lost. If you’re not sure about these top rated walkie talkies, then the following buyer’s guide is going to help you to make the most informed decision. We’re going to talk about what features you want to look out for, so that you can get the best possible walkie talkie for your kids. What is a Kids Walkie Talkie? Walkie talkies make a wonderful addition to camping trips, outings, and children’s playhouses. They allow children to communicate with one another and with their parents in a fun and adventurous way. These two-way radios are now a part of everyday life, and they can also be used in the workplace such as at construction sites, office buildings, and so many other places. Children’s walkie talkies are different because they’re smaller in size, and these usually come in fun colors and with charming designs that kids love. Children’s walkie talkies are also easy to use, usually featuring one-touch operation that even the smallest kids can master in no time. It makes it easier for them to communicate with their family and friends, both indoors and outdoors. You can get anything from the most basic walkie talkies to those that are a bit more complex in their construction and functions. Before you buy, it’s best to know what’s out there, so that you can make the most informed decision when it comes time to purchase. Do some research online to see what models of walkie talkie consumers are raving about, and it’s always smart to buy brand names that you know that you can trust. No matter what kind of walkie talkie you buy, you’re going to see that your kids are going to absolutely love to talk to one another with these devices. They’re fun for both indoor and outdoor use, and when you buy units that are made from durable materials, then they can seriously stand the test of time. When you’re looking to buy the perfect walkie talkies for your children, then there are certain factors that you want to take into consideration. Budget should be your first concern, so ask yourself how much you’re willing to spend on the walkie talkies before you head to the retail store. When you want a brand new model, then you’re going to be spending just a bit more than if you buy an older model or second hand walkie talkies. There are also models that have special features such as GPS, and these kinds of models are going to cost you a bit more than the more basic walkie talkies will. You can get walkie talkies in the traditional style, and these will often fit in a belt holder or holster, so that they can be carried around with ease. There are also those that can be affixed to the wrist or even headset models that allow for hands free operation. These are the most convenient, and they’re great for when your children are engaged in outdoors activities. There are many different kinds of walkie talkies on the market, and the one that you select should fit your specific needs. It really comes down to personal preference and pricing, in the end. You want to select a walkie talkie that has the features, brand name, ease of use, and style that you crave. Walkie talkies are going to vary greatly in terms of price, features, and range, and that’s why you need to learn about all these specifics before you make your purchase. Wrist Walkie Talkies: Wrist walkie talkies are similar in appearance to a watch, and they offer you convenience and ease of use. Some will even have an actual watch feature, which is a great added bonus. The downside to watch walkie talkies is that they’re more limited in range than a handheld device, but they’re a lot of fun for children to use, and for those who aren’t looking for an elaborate, sophisticated walkie talkie. Kids also love these kinds of devices because they remind them of spy movies, and they’re also an affordable choice for parents. These are great devices should parents and children get separated when they go to the mall or to see a movie. They allow you to stay connected with a limited range of distance. These are powered by wrist watch batteries and these can even be rechargeable. 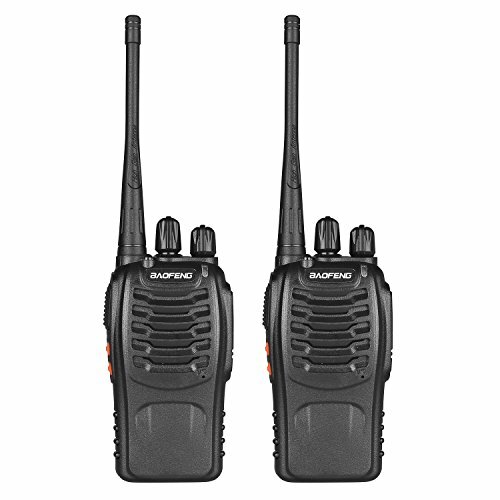 This kind of walkie talkie is lightweight and simple to operate, and they’re also good for beginning walkie talkie users who aren’t looking for a lot of power. Headset Walkie Talkies: This kind of walkie talkie slips over the ear and they have a small speaker and microphone so that operation is completely hands free. These are quite small in size and they’re practically undetectable. The speaker fits into the ear like an earbud, and they’re comfortable to use. You can get either an in-ear model or a headset model, and this will slip over the ear like an earphone. This kind of walkie talkie is simple to set up, but there are really no additional features that they offer the user. There are a number of brands that manufacture these kinds of walkie talkies, and they’re really small and undetectable. Some models are even similar in appearance to headphones. When you want more private communication, then this kind of walkie talkie is going to be right for you. Traditional Walkie Talkies: Most walkie talkies for kids are going to be traditional in appearance, and these are the standard walkie talkies that are handheld. There are a number of brands that make these kinds of walkie talkies, and they have the longest talking range. You can find walkie talkies that will go for up to 20 miles in distance, but kids walkie talkies will generally have a smaller range. Traditional walkie talkies offer you more features than the other types, and some even have GPS capabilities as well as private channels, rechargeable batteries, and weather resistant materials. These are all handy features when you’re looking to buy a walkie talkie that can be used outdoors in the elements. You can also find walkie talkies that are Bluetooth enabled, and this means that you can put an earpiece in for hands-free operation. These are the best kinds of walkie talkies for kids, and they’re perfect for use in the outdoors. You can even gets models that have built-in compasses or thermometers as well. Some will even come equipped with a radio for even more options. Generally, walkie talkies for kids are going to have less features than the ones that are manufactured for adults. Using a walkie talkie is more fun for kids in terms of talking with a friend or family member, and this inspires better communication. They generally come in two different styles for kids, and these are the handheld models and the wrist variation. Handheld walkie talkies are going to be small in size, so that they can fit into small hands, and they’re quite easy to operate with simply the push of a button. They’re not going to have as long of a range, but they are probably going to have volume control and they’re going to be easy to use both indoors and outdoors. Kids walkie talkies are a great investment for both kids and parents, because they inspire fun communication, and are great for both indoor and outdoor use. They’re perfect for camping trips, but they’re also great to use around the house so that you can talk to your child no matter where they might be. Owning and using kids walkie talkies is wonderfully easy, and you’re going to see that setup just takes a few moments. It doesn’t take your child very long to get the hang of using one of these walkie talkies, and most of them are built from durable materials that can withstand the elements. When you’re ready to purchase a high quality kids walkie talkie, then going for one of the top rated models is definitely a smart choice. Should you desire more features, then the buyer’s guide should assist you in finding another model that is going to suit your needs.